This article is about the supercharged four-cylinder motorcycle announced in 2014. For the 3-cylinder motorcycle of the 1970s, see Kawasaki H2 Mach IV. The Kawasaki Ninja H2 is a "supercharged supersport" class motorcycle in the Ninja sportbike series, manufactured by Kawasaki Heavy Industries, featuring a variable-speed centrifugal-type supercharger. The track-only variant is called Ninja H2R, and it is the fastest and most powerful production motorcycle on the market; it produces a maximum of 310 horsepower (230 kW) and 326 horsepower (243 kW) with ram air. The H2R has 50% more power than the fastest street-legal motorcycles, while the street-legal Ninja H2 has a lower power output of 200 hp (150 kW)–210 hp (160 kW) with ram air. Its namesake is the 750 cc Kawasaki H2 Mach IV, an inline triple that was introduced by Kawasaki in 1972 to "disrupt what it saw as a sleeping motorcycle market". In June 2015, TT race competitor James Hillier rode a Kawasaki H2R as an inter-race demonstration lap, at near-race speeds, using normal Superbike slick race tires, around the 37​3⁄4-mile road course, leading to a roads TT record of the highest top speed attained in the Isle of Man by a motorcycle. The top speed of "over 206 mph" (332 km/h) on the Sulby Straight was recorded on Hillier's personal Strava GPS smartphone app for cyclists. On June 30, 2016, Kenan Sofuoglu, a five-time world champion Supersport circuit-racer, made a top speed attempt. Kawasaki supplied a stock H2R, other than special-formula rubber tires developed by Pirelli for the top speed attempt to withstand extreme high speeds, and the bike was supplied with race-grade fuel. Sofuoglu was supplied with a special one-piece leather suit to enhance aerodynamics for his record attempt. This attempt, with the Turkish president in attendance, was made across the then-newly completed Osman Gazi Bridge, the fourth longest in the world at just over a mile and a half. 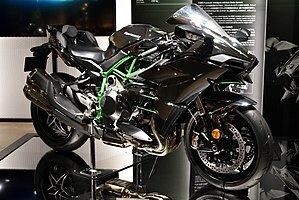 Kawasaki quoted the H2R maximum speed to be 380 kilometres per hour (240 mph). After training and preparing for four months, a speed of 400 kilometres per hour (250 mph) in just 26 seconds was claimed by a video-recording of the bike's dashboard display. The speed was not officially confirmed or independently verified. No fixed point optical sensors for distance/speed calculations, chronometers or hand-held devices were used, and later with a theoretical calculation, of the distance he traveled in 26 seconds on the 8,799-foot-long (2,682 m) bridge. Cycle World's Kevin Cameron had calculated two years earlier that with the right gearing, the H2R's engine power could theoretically overcome aerodynamic drag up to 250–260 miles per hour (400–420 km/h). Front: 43 mm telescopic fork, preload adj. Rear: Single shock, preload adj. The street-legal Ninja H2 has rear-view mirrors in place of the track-only H2R's wings. It also has plastic body panels in place of the H2R's carbon fiber. The street-legal bike is said to make 200 horsepower (150 kW), probably with reduced supercharger boost compared to the H2R. The H2 and H2R share the supercharger (with a lower boost level on the H2) and many other components, with the exception of head gasket, cam profile and timing with ECU mapping, and exhaust system as well as the R's clutch has two additional plates. Cycle World has recorded a 1/4 mile time of 9.62 sec. @ 152.01 mph (244.64 km/h) with a 0 to 60 mph acceleration at 2.6 seconds and a top speed of 183 mph (295 km/h). Kent Kunitsugu, editor for Sport Rider magazine, competing in a land-speed racing event in Mojave, California at the Mojave Air and Space Port airfield in the Mojave Magnum land-speed racing, took a Ninja H2 with just a few bolt-on performance parts adding over 70 horsepower and achieved a top speed of 226.9 mph (365.2 km/h). For 2017, Kawasaki made a limited-edition model with 120 units produced globally: the individually-numbered Kawasaki Ninja H2 Carbon with special paint and carbon-fiber upper cowl. For 2017, the standard model Kawasaki Ninja H2 is also updated. For 2018, Kawasaki made a new sport touring version of the H2, the Kawasaki H2 SX, with a claimed wet weight of 256.1 kg (564.5 lb). Features that are options on the base model H2 SX come standard on the Kawasaki H2 SX SE, which has a claimed wet weight of 260.0 kg (573.3 lb). With revised throttle bodies, camshafts, crankshaft, pistons, cylinder and cylinder head as well as a new exhaust system aimed at increasing mid range torque. The intake system and supercharger impeller were also redesigned. A new larger gas tank, rear trellis subframe and panniers increase the bike's weight by 19 pounds (8.6 kg). For 2019, the H2 received an update with 15 percent more power from updates to the intake, plugs, ECU, air filter and more. There is new all LED lighting and a special top coat on the paint that is claimed to be self healing, which in warmer conditions, is able to smooth over small scratches. Also new are lighter and smaller Brembo Stylema calipers, a new TFT dash, plus smartphone connectivity that gives vehicle information about GPS route information, speed, rpm, gear position, fuel mileage, fuel level, and odometer. On August 12, 2018, rider Shigeru Yamashita with an unofficial team of Kawasaki employees (known as Team 38) set a 202.743 mph (326.28 km/h) speed record in the Southern California Timing Association (SCTA) P-PB 1000 class for under-1,000 cc displacement production supercharged motorcycles with limited modifications at the Bonneville Speedway. On August 15, he broke his own record with a new speed of 209.442 mph (337.06 km/h). Kawasaki selected the literbike platform for its top-of-the-line Ninja H2-H2R model, rather than continuing with the higher-displacement hyperbike Ninja ZX-14. Kevin Cameron explained that the liter-class is "the center of the high-performance market", attracting the best development in racing, with the best chassis and suspension design, so it made sense for Kawasaki to create a machine that could leverage this. Cutaway H2R engine and supercharger. Orange painted plenum surrounds impeller, behind which is visible part of planetary gear system. The H2-H2R engine is a 998 cc inline-4, four-valve, dual overhead cam design with a two-speed, centrifugal supercharger. The supercharger is driven by a series of gears and shafts connecting the flywheel to a planetary drive, finally spinning a dog-shifted two-speed shaft attached to the impeller. Rider control is throttle by wire. Electronic rider aids include anti-lock braking system (ABS), traction control (KTRC), engine braking control (KEBC), Kawasaki quick shifter (KQS), electronic steering damper (ESD), and launch control (KLCM). The front fairing of the Ninja H2R incorporates stub-wings, which are made of carbon fiber just like rest of the H2R-exclusive bodywork. They may be aerodynamic devices designed to create a low-pressure zone to help move cooling air through the engine bay, or to produce downforce at high speed, or to provide straight-line stability in a short-wheelbase sportbike chassis. The H2 and H2R have a tubular, thin-wall steel trellis frame and a single-sided swingarm, with traditional sportbike wheelbase. The H2 was pre-announced by Kawasaki in a late 2014 teaser campaign, and was widely expected to be fully revealed at the Intermot trade show the same year. Before full details were released by Kawasaki, the supercharged inline-4 engine was thought by several industry observers to be identical to, or closely related to, a nearly 1,000 cc inline-4 unit with a centrifugal supercharger displayed by Kawasaki at the 2013 Tokyo Motor Show. [a] Kevin Cameron published an analysis showing an engine of that displacement, mildly boosted at 5 psi (34 kPa), would generate 203 horsepower (151 kW), beyond that of Kawasaki's current leader, the 191.7 horsepower (143.0 kW)) ZX-14 (the horsepower figures are expressed at the rear wheel). The same engine would generate 257 horsepower (192 kW) with 10 psi (69 kPa) of pressure. His analysis included a discussion of the benefits of a two-speed supercharger for this application, to provide more linear power delivery (as opposed to the intractable Japanese turbo bikes of the 1980s that suffered from turbo lag). Cameron also said Kawasaki patent documents suggested the engine would rely on evaporative cooling using port fuel injection, instead of a bulky intercooler. ^ Cameron also recalled Kawasaki's supercharged piston engine experience with the WWII era Kawasaki Ha40 aircraft engine. ^ a b c d e f g h Canet, Don (May 17, 2015). "2015 Kawasaki Ninja H2 and H2R – FIRST RIDE". Cycle World. Retrieved February 14, 2016. ^ "IOMTT: Hillier & Ninja H2R Set Roads TT Record". Cycle World. June 11, 2015. Retrieved February 14, 2016. ^ Kunitsugu, Kent (May 18, 2015). "Videos: Kawasaki Ninja H2R goes head-to-head against three supercars". Sport Rider. Retrieved February 14, 2016. ^ "VIDEO: Insane Speed On the Kawasaki H2R at Isle Of Man TT". Motorcyclist. June 15, 2015. Retrieved February 14, 2016. ^ a b "Production Bike World Record 0-400 kmh in 26 sec. HD". June 30, 2016. Retrieved June 30, 2016. ^ a b MacDonald, Sean (July 7, 2016). "400 KPH On A Production Motorcycle". Cycle World. Retrieved July 21, 2016. ^ a b Shields 2014. ^ a b Newland 2014. ^ a b Bennetts 2014. ^ a b Olgiati 2014. ^ a b c d e f Motor Cycle News 2014. ^ a b c d e Cameron 2014a. ^ "IOMTT: Hillier & Ninja H2R Set Roads TT Record (Video)". Cycle World. June 11, 2015. Retrieved November 21, 2016. ^ Contractor, Sameer (July 1, 2016). "Kenan Sofuoglu Hits Top Speed of 400 Kmph on the Kawasaki Ninja H2R". Car and Bike. Retrieved July 1, 2016. ^ a b Tibu, Florin (July 1, 2016). "400 KM/H in 26 Seconds Aboard a Kawasaki Ninja H2R". Autoevolution. Retrieved July 1, 2016. ^ "Kenan Sofuoglu hits a bonkers top speed of 400 kmph on the Kawasaki Ninja H2R". WheelStreet. July 1, 2016. Retrieved July 1, 2016. ^ Zoltan, Bogdan (July 1, 2016). "Kawasaki Ninja H2R Goes From 0 To 400KM/H Or 249MPH In 26 Seconds". Carscoops. Retrieved July 1, 2016. ^ Sofuoglu, Kenan (June 30, 2016). "Kenan Sofuoglu break World record by reaching 400 kmh with Kawasaki Ninja H2R. HD". Retrieved June 30, 2016. ^ Azmi, Thoriq (July 1, 2016). "Kawasaki Ninja H2R hits 400km/h". bikesRepublic.com. Retrieved July 1, 2016. ^ Marsden, Liam (July 1, 2016). "Kenan Sofuoglu reaches 249mph on Kawasaki H2R". Motor Cycle News. Retrieved November 24, 2016. ^ Collins, Andrew (June 30, 2016). "Kawasaki H2R Proves It Really Can Go 249 MPH On A (Closed) Public Road". Jalopnik. Retrieved July 1, 2016. ^ a b c d e f Cameron 2014b. ^ a b c d Hoyer, Mark (November 6, 2015). "2015 Kawasaki Ninja H2 – ROAD TEST REVIEW". Cycle World. Archived from the original on October 31, 2016. Retrieved February 14, 2016. ^ Kunitsugu, Kent (July 7, 2016). "Video: High Speed – Running Kawasaki's Ninja H2 to 226.9 mph". Sport Rider. Retrieved July 21, 2016. ^ "Rotobox Carbon-Fiber Motorcycle Wheels Proven at 226.9 mph". Sport Rider. April 28, 2016. Retrieved July 21, 2016. ^ "Kawasaki Unveils Limited Edition 2017 Ninja H2 Carbon Superbike". Motorcyclist. February 2, 2017. Retrieved February 6, 2017. ^ Kunitsugu, Kent (March 28, 2018). "Kawasaki's 2018 H2 SX SE Is The Most Powerful Sport-Tourer You Can Buy". Cycle World. Retrieved April 17, 2016. ^ Gustafson, Joseph (November 7, 2017). "2018 Kawasaki H2 SX Sport-Tourer Debuts—Get Ready To Wet Your Gore-Tex". Cycle World. Retrieved November 14, 2016. ^ "Kawasaki Gives H2 Lineup More Power For 2019". Roadracing World. August 10, 2018. Retrieved August 14, 2018. ^ Chung, Dennis (August 10, 2018). "2019 Kawasaki Ninja H2 Updated, Now Claims 228HP". Motorcycle.com. Retrieved August 14, 2018. ^ a b c Tibu 2014a. ^ a b c d Blain 2014. ^ a b c d Kiser 2014. ^ a b c d e Kunitsugu 2014. ^ "Kawasaki Ninja H2: Electronic aids revealed - Shifting-Gears". Shifting-Gears. 2014-10-20. Retrieved 2017-09-27. ^ "Kawasaki Ninja H2 Launch Control And Quickshifter". Speed Society. Retrieved 2017-09-27. ^ a b Stock 2014. ^ a b Beeler 2014. ^ a b c Abrahams 2014. ^ Lenatsch, Nick (March 7, 2012). "Kawasaki ZX-14R – Road Test". Cycle World. Retrieved July 4, 2016. Wikimedia Commons has media related to Kawasaki Ninja H2. This page was last edited on 23 February 2019, at 04:14 (UTC).